For us, the answer to that question is pretty simple. It’s so important, because we are uber committed to being the driest Portland golf course. I mean it’s a fundamental part of what we do. It’s something we consider as part of all our ‘how do we invest in our property for the future’ conversations. That may seem odd to some when you consider the rumors that have swirled around over the last 10 plus years. For those not aware, there has been a ton of rumors about the property owners ‘bulldozing the golf course’ for some other use. 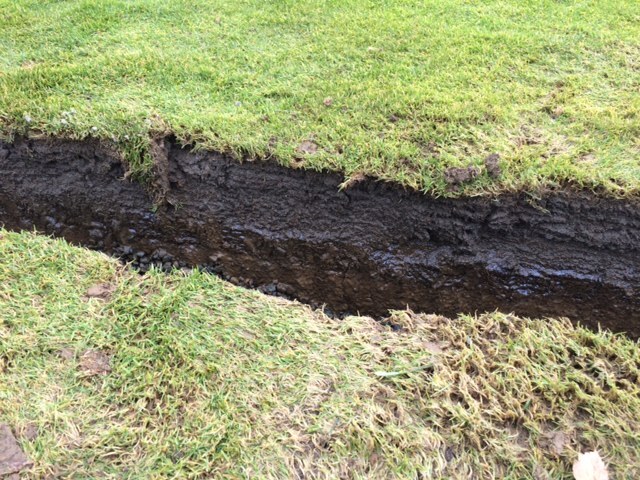 To us, putting in 25,450 feet of fairway drainage is bigger than just attaining the distinction of being the most playable Portland golf course year round. It’s about sending a message that we are here for the long haul. So what does it take to put in 25,450 feet or nearly 5 miles of fairway drainage? Well, first it takes 25,450 feet of perforated drainage pipe, of course. And, 100 cubic yards of aggregate (rock) to surround the perforated drainage pipe. 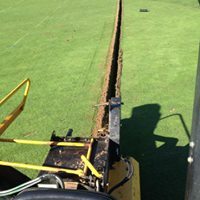 Before the aggregate and pipe go in the ground, it takes about 6 to 8 crew members, 3 heavy duty utility carts, a bunch of shovels, a tractor, and one highly specialized trencher. The trencher is a must, because without it the project is almost not worth doing. There are many types of trenchers out there. You can easily rent them from Home Depot. But, with most trenchers the remnant damage to the fairway would take far too long to heal making the project a long term intrusion. With our specialized trencher, we are able to dig the trench and remove the excess material with almost zero damage. In the end, the finished project is much cleaner. The final step to complete the new drainage is to top everything off with sand and seed. While the winter is not the ideal time to grow new grass. As a matter of fact, it’s nearly impossible. The winter is the best time to install new drainage as it most obvious where the needed drainage belongs. So to reiterate the point, while fairway drainage is uber important to us, it’s about more than just being know as the driest Portland golf course. We are here for the long haul and hope to send that message to the Portland community. Please help us spread the word.